Runner: "Have you seen the new Triumph? Saucony is going after Maximalism (Hoka), That shoe is beautiful"
Retailer: "Oh we are selling it really well, that upper fits like a sock"
Competitor Magazine "Iso Fit Technology - A wrap system that creates near-custom fit with a soft inner sleeve and a floating cage that adapts to the precise shape and movement of the foot"
Let's take a step back and talk a bit about Saucony. For over 2 decades Saucony has been one of the default women's running brands. All the way back to the first Jazz the fit of Saucony running was really good for women. In fact many brands have studied Saucony fit when they made attempts to create unique women's shoes for their own line. The most interesting thing is that Saucony didn't set out to address the woman's foot. In fact for all those years they used one last for men and women. The result of all this is a lagging men's business. Brands as they start out unless they are women's only brand will skew heavily towards the men's side of running. Once that side of the business is established they turn concentration to women. To be more clear the brand is not going after men. Men are after new technology in their running shoes and are more willing to take a risk on a new brand. To have a brand like Saucony with more than 50% of their business with women is really unique in the running shoe world. One shoe to break that mold for Saucony with men was the Kinvara. I'll talk later when the Kinvara 6 comes out in Fall 2015 but I believe and have for a few years that the Kinvara is the perfect shoe. So it excited me when I took my first look at the new Triumph and saw in it a great deal that makes the Kinvara so good. In fact it's clear to me that Saucony wasn't looking at Hoka but at their own shoe the Kinvara when they made the change to this Triumph. in doing so I think they give the runner looking at the Hoka Clifton another option to try. When I finally got the chance to try it on it was instant, Saucony has a men's shoe. That's not to say that they are giving up on women. In fact I believe the Triumph is now positioned so well in fit and feel that it will work equally for both genders. Looking at the lateral side profile you can see a couple very big upgrades on the midsole. First is the constant ground contact flat bottom. This ensures that no matter where you strike the ground first (heel, midfoot, forefoot) that you will land on soft foam and be in contact with the ground until you toe off. The second thing to notice is all the articulation in the side wall. This ensures when you do strike that the shoe is smooth through transition. On the medial side of the shoe it's all business. Very little articulation. The idea behind this to create some support in the midsole. Virtually all runners have some pronation in their stride. The supportive medial side is just their to keep the foot tracking over the meat of the forefoot. With this outsole view you see the full constant ground contact surface area. You can also see the lateral side release where the rubber pods from the heel though the forefoot match the articulation we saw in the lateral side view. The only draw back in this design is the center channel under the heel. It's just wide enough to collect rocks or sticks and narrow enough to keep them in your shoe until you stop to remove them. At closer look you can see the deep flex grooves that get a bit wider to the lateral side. When you put these shoes on and walk in them you can actually feel the outole under your foot. It's similar to the feeling of socks with grippers on the bottom. You feel like you are almost sticking to the surface. The insole (sock liner) is molded to the last (same last as Triumph 11) and you can see the shape of the bottom of the last in the contours of this sock liner. There is good arch support medial and lateral and there is good feel in this liner. 200 miles in to the shoe and the sock liner held up well. Inside the shoe you can see the Iso Fit upper. It's a one piece construction sleeve. No traditional tongue to deal with. You can see here that the sleeve is there to fit around your instep and then it's sewed into the upper just past your arch. With all of this seaming I wouldn't suggest running without socks. When you first see the shoe you can't help to notice the thick padded heel. I'm not 100% sure why they went so thick unless it's to make up for the challenges in the cage (see below). I will note that this skinny heel (me) runner appreciated the thick heel. If you have the rare wide heel I think this shoe will be a challenge to fit. Any time a brand goes to a cage system for the lacing it produces challenges. Because each eyelet is independent there is a tendency for one or two of the cage fingers to bend or twist out of place and for the footwear developer it takes lots and lots of pattern work to get it right. I think Saucony did a really good job figuring it out although there are a few things I would have changed. The very top (last) eyelet is positioned too far back. I believe runners with a high instep will struggle with this eyelet placing. There will be a strong tendency for the lace to dig into the top of the foot at the ankle joint. Personally I noticed it each time a laced the shoes but will admit to never noticing it while running. But I have virtually no instep which is why I believe there will be some issue. The other minor concern I had with the shoe is that there is one fewer eyelet row. The runner who likes a really tight fit will struggle to get this shoe tight enough. All that said, I'm super impressed with the cage in this shoe. I would not say it fits the precise contours of my foot but I would say it's really, really comfortable. From the first run to the last I never once had to stop and adjust the fit. One final note before I really dig into the results. The trend in midsoles at the maximum or over sized level is soft, really soft. I've been running on paths most of my adult life. In Germany or in Cardiff I would rather run on a soft dirt path than on a hard road. Until very recently it's been without incident. The first incident was last spring in a Hoka Rapa Nui. 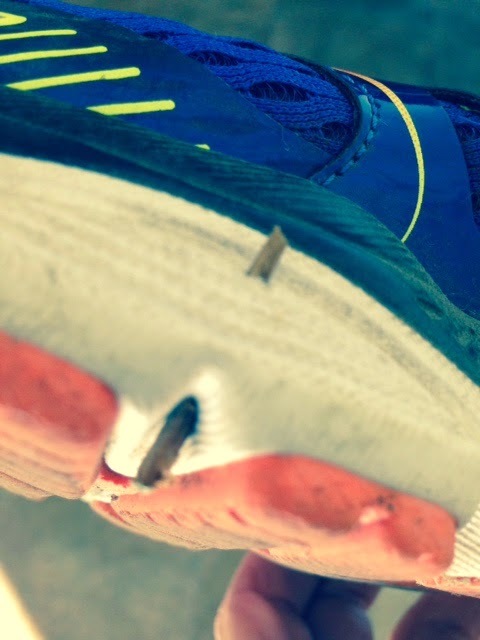 I was not more than 1 minute into my run (through the park across the street from my house) when a stick went completely through the bottom of the shoe and into the soft part of my forefoot. I pulled the stick out and blood started to flow. You can see in the picture above that it happened again. Lucky for me that the stick when out the side wall and not into my foot this time. Just something to be aware of in these new shoes. It's a good thing to check your shoes after each run to pull out potential hazards. I bought this shoe with some trepidation. For years I worked with Saucony in my retail days. I loved the people there and the business we were building. But I never ran in their shoes. They didn't fit my foot at all and I always thought they were stiff and clunky. When they introduced the Kinvara finally I had a shoe I could run in. But only one. I was very pleasantly surprised by the Triumph ISO. My first run in the shoe straight out of the box, was a 5K time trial test on the roads. I felt the shoe reacted really well to the hard pace and held my foot well. 200 miles later I still have the same feeling. The shoe delivers exceptionally well for a maximum cushion shoe. It's really soft yet supportive. The constant ground contact is smooth and quiet on the road. You should not hear your feet when you run and this shoe will help make sure you don't. The forefoot is like butter the entire run. Long runs, hard runs, road runs, uneven path runs, the forefoot held my foot up and softened the blow. I really hesitate to say I liked the shoe for me. Typically if I like a shoe for myself it's not going to be great for all other runners. I learned early on to put my personal feelings aside. Working for brands I rarely liked anything for myself. The more I didn't like it the better the shoe actually did for everyone else. But I firmly believe Saucony built a really good shoe that I like and that millions will like too. I think the upper has enough room to fit most feet (high instep runners will struggle) and it has enough adjustment available. The midsole is full, soft and smooth. There is very little not to like in this new Triumph. Strong similarities in the heel. The one change that helps in the smooth ride is they moved the Power Grid from between foam pieces (black shinny line in the center of the midsole on the right shoe) to just under your foot (orange piece on top of the yellow midsole). With this you get the full feel of the soft foam and having it closer to your foot makes the platform smoother at impact. You can see the difference between constant ground contact at the top and the plastic support bridge in the Triumph 11. I believe everyone will benefit from the full ground contact but I also know some will find this change to be too drastic. For sure there is an adjustment period going to full contact. You can see in the Medial side of the Triumph 11 that there is a great deal of supportive business going on. It's supportive in the upper and in the midsole with the plastic bridge wrapping up the side wall. Under the arch and through the upper the support in the 11 and 12 are equal. The 11 does it through the upper and that bridge where the 12 uses the ground (full ground contact) to provide the support. The big difference between the two shoes is in the forefoot past that bubble looking section in the forefoot. In the Triumph 11 pictured just above you see there is very little taper from that bubble to the tip of the shoe. In fact it's quite full and supportive all the way to toe off. (by the way I personally can't run in the Tirumph 11 because of that piece. It doesn't compress or flex enough for my foot and my foot gets really tired fighting it). If you go back up to the medial side of the Triumph ISO 12 you will see a dramatic taper from that bubble to the toe. There is a section on top of that midsole that is painted black which gives the thought that the midole is thinner than it is but with or without the black paint you can see the taper to much less foam. Looking at the toe of the shoes in this photo you can see the effect of the taper. On the same last (Usually toe spring is built into the last) you can see the dramatic toe spring in the Triumph ISO 12 vs the Triumph 11. Because of this change I believe a good number of Triumph 11 runners will not like the unsupportive feel at this point of the gait. You will feel like you are falling off the shoe. It's a big enough change to feel. Another caution in the new shoe is Fit. Saucony has always been known for a wide fitting toe box. The Triumph 11 actually fits slightly wide even for a Saucony. The Triumph ISO 12 does not. So if you liked the Triumph 11 for it's wide fit you will probably have to go up in size to get the same fit. Not impossible to accomplish but annoying. Saucony talks about 20% more cushioning and attaches that number to the PowerGrid+. Yes they changed the material make up and the position of the Power Grid but it's not there where you feel the cushion. The 20% (If that's a true measure) is in the much softer midsole and in the constant ground contact. To wrap it up a bit. If you run in the Kinvara but always wanted more shoe for longer runs or recovery runs you now have one. Looking at the Neutral shoe group above, if you feel the Glycerin or Nimbus are too stiff or that the Clifton and Energy Boost are too wide and unsupportive in the upper the Triumph ISO 12 is a great option in the middle of all of that. Also if you are like me and have struggled to find a Saucony shoe you like I highly suggest you give this shoe a spin.